Some of the legislators opposed to the age limit bill address journalists recently. Courtesy photo. 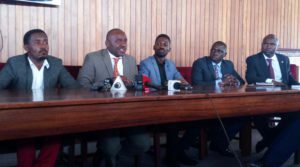 PARLIAMENT–The mood of anticipation over the expected report on the age limit bill reached a peak this morning as MPs and the public alike geared themselves for what was likely to be a tense debate over the report that has been the center of media speculation over the past few weeks. The committee on Legal and Parliamentary Affairs was holed up in the plush and luxurious Serena Kigo resort over the past week to draft the report on the contentious constitution amendment No.2 Bill, the report will inform debate on the floor of the house. The MPs on the committee led by the chairperson, Budama South MP, Jacob Oboth Oboth, had to subject themselves to a vote on the contentious proposal to scrap presidential age limits, a proposal that has pushed political tensions sky high and amplified political rivalries as the ruling party jostles with those opposed to the bill including from within its own ranks. Even though the committee eventually approved the removal of the age limits with a total of 18 MPs in support, the report will have to be subjected to a vote of the whole House. Such a showdown is what has kept both MPs and the general public on tenterhooks as most thought the report was scheduled for tabling this afternoon. This showdown has now been postponed probably for tomorrow as the contentious report was not included on the order paper among the business to be handled today. The Dokolo County Member of Parliament Felix Okot Ogong, an NRM member opposed to the bill, however, says that despite the exclusion of the age limit bill from the order paper today, they will be ready to defeat it anytime it is lined up for debate. He anticipates that the debate is scheduled for tomorrow. “What is clear and apparent is that they are going to bring it this week, if it’s not today then its tomorrow but it won’t go outside this week,” he told PML Daily. The Kassanda North MP, Patrick Nsamba, another NRM MP opposed to the bill, says they will remain alert and stay focused at whatever time the report is presented. “For us we here we suspended everything, anytime it comes, because we know their plan is not even to debate it, they just one to bring it and then someone says we vote we vote, we want to stop that,” he stated. Both the NRM and the Opposition have been engaged in closed door meetings this morning to plan and strategize on how to approach debate on the report once it is finally tabled on the floor. Even though the NRM boasts of numbers to push the amendment through the MPs opposed to the bill are confident they have won over a good number of neutral NRM MPs to deny the ruling party the two thirds majority it needs. The Butambala County MP, Muwanga Kivumbi, says the voters have put their individual MPs on pressure to reject the amendment. “A campaign is under way and it is yielding positive results, I know a couple of MPs who can’t even sleep in their own homes,” he said. The Agago County MP, Edward Makmot, told this reporter that Ugandans ought to remove political sentiments out of this debate and approach it from a purely legal angle. He notes that arguments like the age limit is illegal because President Museveni has ruled for over 30 years cannot stand up to legal scrutiny and that in the end only the law remains standing, he does, however, acknowledge that it is difficult to leave politics out of such a contentious debate. Makmot who is a member of the legal committee reveals that MPs on the committee voted to bring back term limits. He believes that such a compromise will be able to go a long way in cooling tempers and calming a highly charged house that has already seen some of the worst violence within General Assemblies in the region.